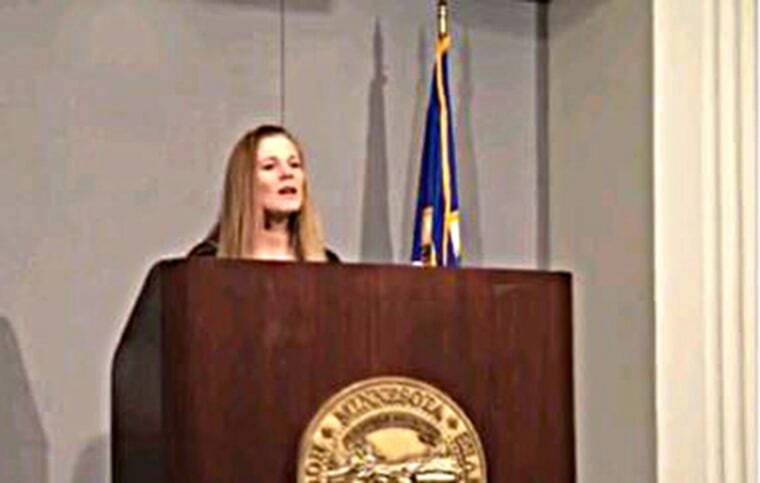 A Minnesota mom filed a lawsuit Wednesday against her 17-year-old transgender daughter, along with county health boards, a school district and local health care nonprofits. Calgaro's lawsuit challenges a Minnesota law that allows minors to access medical care and procedures without the consent of their parents. The emancipation notice was filed in Stearns County District Court in October 2015. But Calgaro disputed the claims about her relationship with her child, and expressed frustration that she was left out of the teen’s subsequent health care decisions. Also included in the complaint was a doctor’s letter dated January 2016 that stated the teen had undergone gender transition treatment and should be issued new identity documents with female gender markers. Kaardal is not the only attorney on the case. Calgaro is also being represented by an anti-abortion law firm called the Thomas More Society. The firm is also currently defending David Daleiden, the anti-abortion activist who was indicted by a Texas grand jury in January for buying and selling human organs in an attempt to frame Planned Parenthood. While Thomas More Society’s other cases include fights against insurance coverage of birth control and trying to block an Illinois transgender high school student from accessing the girls bathroom at school, the majority of the firm’s cases are geared toward fighting abortion. Minnesota's statute that allows minors to make their own medical decisions is echoed in the state's parental notification law regarding abortion. According to Minnesota statute 144.343, no non-emancipated minor may access an abortion procedure until 48 hours after parents have been notified that the procedure will take place. It is unclear whether the Thomas More Society is using Calgaro’s case as a backdoor fight against the abortion law—after all, a minor could ostensibly declare herself emancipated in order to get around the parental notification—nonetheless, the legislative connection is impossible to ignore. While the Thomas More Society’s press release refers to a “life-changing operation” undergone by the teen, the vast majority of transgender people don’t have surgery until after age 18—if they have surgery at all. “Surgery is highly unlikely before 18,” said Jamison Green, a former president of the World Professional Association for Transgender Health (WPATH), the standard bearer for transgender health care policy. For most trans youth, the process of gender-affirming treatment begins with psychological care. Green told NBC OUT that with most transgender teens being at higher risk for self-harm and suicide, receiving support for the identified gender is the first step. Green doesn’t live in Minnesota, so he couldn’t speak with authority on local law and policy. But Phil Duran, the Legal Director at OutFront Minnesota, told NBC OUT the lawsuit’s allegations were perplexing at best. The lawsuit’s references to emancipation also struck OutFront’s Duran as confusing—especially because the state law does not employ the term at all. Instead, it simply allows for minors who are living on their own to make their own medical decisions. The lawsuit asserts that Calgaro’s parental rights are stripped by the law, and also that her constitutional right to due process is violated. “If there had been a court order of emancipation, then Anmarie would have received notice and an opportunity to be heard,” attorney Kaardal said at the Wednesday press conference. But if Calgaro’s lawsuit—which again, names her own teenage daughter as a defendant—is successful, approximately 6,580 transgender and gender non-conforming (GNC) high school students in the state of Minnesota could encounter more obstacles to the care that experts say they desperately need. The estimate of 6,580 trans and GNC teens attending high school comes from the Minnesota Department of Education’s 2016 Minnesota Student Survey—which this year included questions about gender identity for the first time. Responding to a question about whether they identify as “transgender, genderqueer, genderfluid, or unsure about your gender identity,” 2.5 percent of high school students answered ‘yes.’ With the state’s Department of Education data offering a total of 263,238 9-12 graders, that means nearly 7,000 fall somewhere on the gender non-conforming spectrum. David Edwards has encountered quite a few of those teens in his leadership role with Transforming Families, a community-led group that “supports parents of gender-diverse kids.” Edwards also knows firsthand what it’s like to grapple with the challenges of raising a transgender child: He and his wife filed a complaint with the St. Paul Human Rights Department after other parents protested their trans child’s attendance at a local kindergarten. At the press conference on Wednesday, Calgaro—along with attorneys—repeatedly referred to her child as “my son,” using male pronouns exclusively to describe the teen despite the lawsuit including a doctor’s statement asserting the teen’s legal status as female. That raised Edwards’ hackles. “Purposefully mis-gendering a transgender person is an act of violence. To continually do that to your child is not only insensitive but also really harmful,” said Edwards, who added that 38 percent of the trans and GNC teen survey respondents said they had attempted suicide. At the press conference, Calgaro told reporters that “The transitioning thing isn’t even the issue, the issue is that he’s able to make these [medical] decisions.” What Calgaro said she wants is for parents to be notified and included in their minor children’s medical decisions. According to documents included in the lawsuit, Calgaro’s daughter turns 18 next July, meaning that the case will not be relevant to the family for long. But it could inspire more parents to try to oppose their transgender children in court—a terrifying prospect for LGBTQ youth, many of whom already struggle with acceptance at home.